An elementary school teacher in Boca Raton, Fla., was caught on camera kissing a 10-year-old male student in exchange for gummy bears, authorities say. Brian Kornbluth, 28, a teacher at Somerset Academy, was arrested in February after being reported by another teacher for making unusual requests to have male students in the classroom. The student stated that Kornbluth asked him to report to his empty classroom to get gummy bears, and surveillance captured the teacher kissing the student, authorities say. Kornbluth admitted to kissing the boy and pleaded guilty May 16 to a single count of battery as part of a plea agreement, according to the Palm Beach Post. 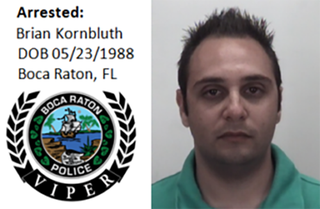 Kornbluth received one year of probation and is no longer working at the school, according to WSVN-7. Kornbluth’s attorney says he hopes to continue his teaching career elsewhere. Read more at the Palm Beach Post and WSVN-7.